YOLO Sportswear was established in 1996, long before the word YOLO went "viral"! If you do a little research, you'll find that Drake was 10 in 1996 and had probably not even dreamt of the word YOLO at that point. Long before YOLO Sportswear was even a consideration, owner Chris Fechter had worked as a house painter. During a summer in the 80's (not sure which year anymore, +/-1985), Chris was working at a house whose owner had a car with YOLO on the license plate. At the completion of the job, Chris finally asked what YOLO meant, "You Only Live Once" he was informed. That was at least 10 years before YOLO Sportswear was established. While discussing names for their new business, Chris yelled out, "YOLO Sportswear" and when they heard what it meant, well....the rest is history. 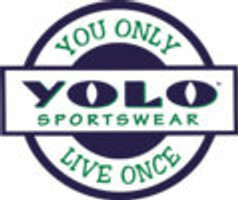 So while you may see and hear many versions and variations of YOLO now, rest assured YOLO Sportswear (who owns the patent to YOLO, You Only Live Once on clothing) was here well before the hype began and will continue to be here long after the YOLO craze fades away. We're not a fad, we're a long standing institution in field hockey and lacrosse and have made many substantial contributions to the sports we service.